Quicksilver's 30 metre luxury sailing catamaran, Wavedancer, offers the excitement of big ship sailing combined with the ultimate in comfort. Let our crew pamper you in the luxurious air-conditioned lounge with its fully licensed bar, or soak up the sun and sea air under the sails on our expansive deck. 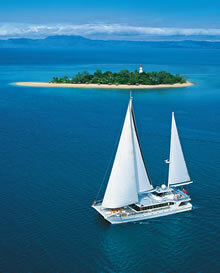 Wavedancer remains moored in the island’s calm lagoon and guests can take a regular shuttle from the beach to the boat.